Photo: Secretary of Education Arne Duncan visited Haiti from November 4-6, 2013. 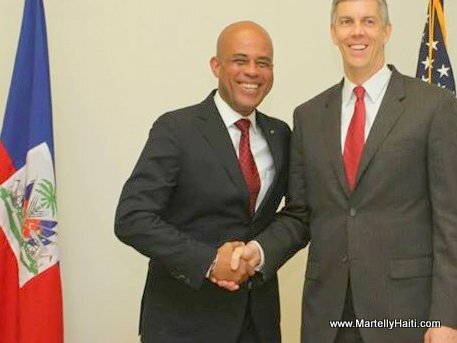 During his visit, Secretary Duncan met President Michel Martelly at the National Palace, where they discussed topics related to education in Haiti. After the meeting, Secretary Duncan announced a new investment in the Room to Learn program. Haiti is one of six countries where Room to Learn will be implemented. Room to Learn is a global education program funded by the U.S. Agency for International Development (USAID) to increase equitable access to quality education. The three-year program in Haiti will focus on making education more accessible for all, with a focus on the most vulnerable out-of-school children.